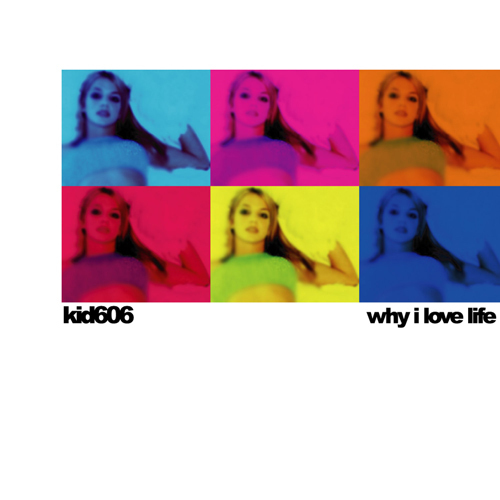 Already being hailed as the Kid's finest work, 'Why I Love Life' acts as antithesis to the mentalist booty plagarisms for Violent Turd and the granular sound destruction and gabbacore assaults of so much 606 material surfaced to date. Having been often quoted as saying that his minimal and tender album for Mille Plateaux 'P.S. I love You' was his least favourite self-penned piece of work, the Kid betrays his masked exterior with this simply breathtaking collection of melodic, open and cathartic pieces. Recorded between 1997 and 2001, this seven-song EP is a snapshot of the Kid sampling his own musical history, picking pieces out of 100+ unreleased and unfinished songs. 'When I Want Something New' stretches a lo-fi, crisp beat across an open expanse of atmosphere and quasi-oriental melodies sounding like Matmos and Isan sharing the controls. 'Something's Not Right' is pure and simple ambient classic, somehow reminiscent of Aphex Twin's Selected Ambient Works Volume II with it's lilting melodies and suggestive progressions - simple and mesmerising. 'Frenchkiss', meanwhile, explores a stripeed down and squashed Discoid flavour that grooves and bubbles with IDM perspective and a bouncing mirrorball groove that's hardly concealed by its lo-fi nature. 7 tracks in total, surprisingly awesome throughout. Recommended.